Time for another profile piece. A sporty way to meet other immigrants to Toronto and bang a ball around a bit. Win-win. “My name’s Ahmed and I’ve been in Toronto just over four years after moving here from Leeds. Nice to have a website that gives you a bit of home every now and then. “I play for a football team here in Toronto called Toronto Irish. It’s a team made up of a mainly Irish lads but there’s a good chunk of English lads play here as well. 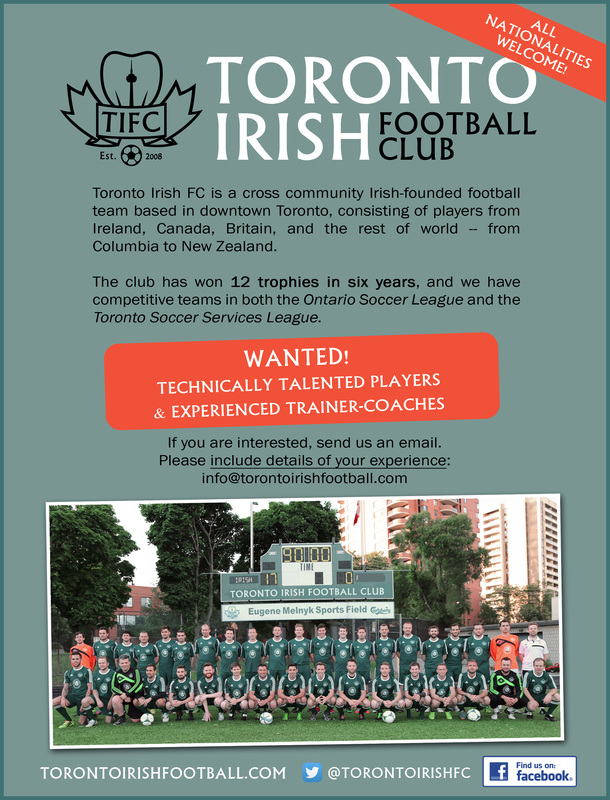 Toronto Irish Football Club (TIFC) was formed in 2008 and although named Toronto Irish Football Club, no race, religion or ethnic group is excluded. The club is home to a core of players from the Emerald Isle along with good chunk of British, Canadian and rest of the world players thrown in for good measure. The club has 50 playing members across both of the teams. It’s been an honour that we’ve had players from all over the globe play for the club and we welcome more to do so. In addition to on-the-field activities the club has a lively social focus helping recent immigrants settle into a new city. The club currently runs two teams in different leagues. Our top team plays in the Ontario Soccer league (OSL) where the standard is high and teams come from across the GTA. Our other team competes in the Toronto Services Soccer League (TSSL) Premier Division: the top tier of the oldest organized football league in Toronto. This league is based more locally with matches often played within city limits. The team is 100 per cent non-profit, with player fees, fundraisers and sponsorship used to pay league and referees fees, to rent training facilities and for other essential expenses which keep the club running. Coaching, management and administrative staff volunteer their time to keep the football competitive, the lights on and (on occasions) the refreshments flowing. The clubs prides itself on putting its players in positions to succeed and when it comes to training and games we use quality facilities. Our home games are played at Monarch Park Stadium (South of Coxwell subway station) at 1:00 p.m. on Saturdays. Our current training centre is St. Michael’s College School (St. Clair West subway station) but we will be moving to a new facility come May 2015. Training sessions usually last two hours. TIFC has come a long way since joining the Toronto Multicultural Soccer League in 2009 and winning the league and cup double with a cup final outing at BMO Field. In 2010 TIFC joined the TSSL and successfully won the Media B division in its first season. 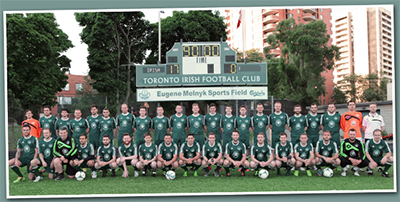 In 2011 Toronto Irish FC expanded to two teams, with 50 playing members. One team entered the TSSL First Division, while the other competed in the Second Division. The club’s first season in the TSSL, both sides won their respective leagues, and therefore were promoted. In 2012 the Premier Division team won their Division, (the highest level in Toronto amateur soccer) while the First Division team gained promotion to the Premier Division for 2013. 2013 was a historic year for the club after entering the OSL for the first time. The OSL demands a higher calibre of player with strong technical ability and Irish were up to the mark winning the George Finnie Cup and finishing just outside the promotion place on the last game of the season. 2014 was a mixed year for the club, the OSL team finished second in the league again missing out on promotion and silverware. The TSSL squad finished second in the Premier missing out on the league title on the last game of the season and also missed out on cup honours. Toronto Irish is not just about the football, the social aspect is an important part of the TIFC culture, being a great way for newcomers to Toronto to get accustomed to their new environment (most of us have been there and done that! ), build new relationships and be part of a great organization. We are delighted to be sponsored by the newly refurbished Elephant & Castle on King Street West (King and Simcoe) and is where our members can be found watching Premiership or European football at the weekends. We also hold frequent events and fundraisers at this location. They kindly provide us with member discounts on food and drink. Given the success of the last few years the club is looking to the future and is taking steps to implement the next stage of development. The success of the last seven years has also raised the profile of the club. Word has spread rapidly about the quality of football played by the club and the professional coaching and management that it is lead by. This has no doubt been a contributing factor to the increase in the number of individuals wanting to play for the club. The club is looking for dedicated players and coaches to be a part of this journey, as we move to the next level. You can contact TIFC via their Twitter or Facebook accounts. Click the recruitment flyer below too. This entry was posted in Uncategorized and tagged brits in toronto, toronto irish football club on March 12, 2015 by britsintoronto.